These homemade Chocolate Chip Cookies are mini-sized, making them perfect for those days when you need 3 or 4! 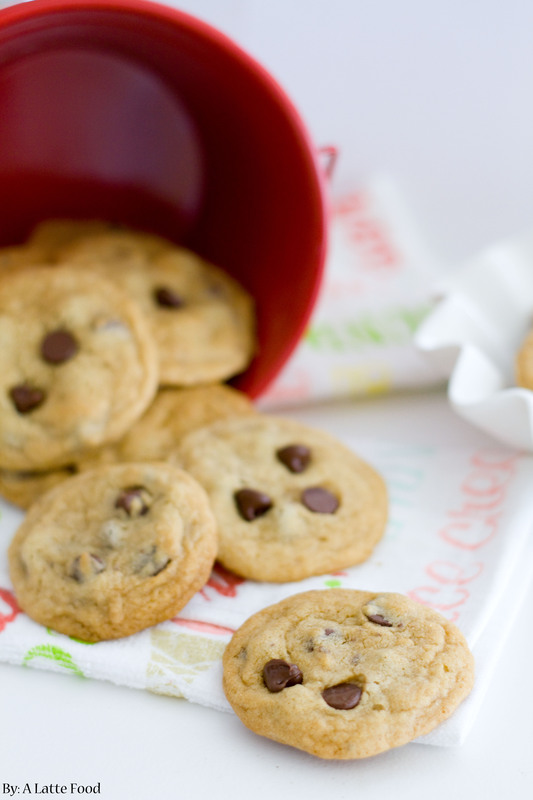 The sweetest (and cutest) Chocolate Chip Cookie dessert! It has been a few days since I’ve posted, which means that I am back from New York! It’s bittersweet, really. What makes vacation so fun and relaxing is the freedom from usual responsibilities. But, if vacation existed all the time, it wouldn’t be nearly as special. I’m already having withdrawals from leaving the city that never sleeps behind, but I’m excited for the next time I get the opportunity to visit. The best part of vacation ending? Sleeping in your own bed. The worst part of vacation ending? Getting back to the daily grind of reality. When you’re on vacation, it’s perfectly acceptable to eat out all the time, skip workouts, and ignore emails. It’s also perfectly acceptable to drink all the iced coffees (guys, it was super hot–totally legitimate excuse), have ice cream cookie sandwiches multiple times, and eat Magnolia Bakery’s Banana Pudding (because life is short and calories don’t count on vacation). We ate really well in New York. We rented out a person’s apartment in the West Village, which was absolutely adorable. It felt so authentic to live in an apartment for a few days and explore the city on foot and subway as if we were true locals. Of course, our feet were killing us at the end of each day, and our awkward limps back to the apartment revealed to every New Yorker we were not locals. But we mastered the subway system and the art of walking quickly like pros. One of our favorite places we visited was Milk & Cookies Bakery. In future posts, I will certainly be going more in-depth on our trip, full of pictures and anecdotes, but for now, we’ll talk about the amazing Milk & Cookies. This place is tucked away in the West Village brownstones on a quiet street. It’s completely unassuming and unpretentious and perfect. We got ice cream sandwiches, which is what they’re known for–me getting one dark chocolate toffee cookie and one milk chocolate caramel cookie with vanilla in the middle and my sister getting both dark chocolate toffee cookies with vanilla in the middle–and let me tell you, it was amazing. It’s actually a really good thing they’re across the country from me because I would probably eat there everyday. I mean, I’d have to try them all, right? Let’s not discuss how many of these I’ve eaten. Preheat oven to 350. Grease a cookie sheet and set aside. With a mixer, beat butter until light and fluffy, about 1 minute. Add in brown sugar and beat until fully incorporated. Add in egg, vanilla, and salt. Mix well. In a separate bowl, sift together flour, and baking soda. Slowly incorporate dry ingredients into wet ingredients. Mix until fully combined. Make each cookie about the size of 2 tsp. Bake for 8-10 minutes or until lightly browned on top.